The Joint: The Diner, 190 Shaftesbury Avenue, London, WC2H 8JL. You can view their website by clicking here. The Vibe: With eight locations across London now, the latest in the bizarrely trendy spot of Dalston, The Diner is far from your one off Mom and Pop style joint. It’s well presented, runs a ridiculously huge menu, and is growing in reputation each week. Their Covent Garden (almost Holborn) location is perched on the corner of Neal Street and Shaftesbury Avenue amidst the shoe shops and face cream pushers. It can get busy during the week so we headed down at midday and picked up their Brunch Burger, The Big V Dog, and a side of Diner Fries. We’re big fans of cooked breakfast items such as pancakes, bacon, eggs, and syrup and combining these with your standard lunch burger sounds like a great idea. The good news is that the Brunch Burger looks incredible but tastes even better. It’s a sweeter bite than most burgers and the pancake can overwhelm the meat a little, but then the egg yolk breaks through and we’re all golden. This is one of your favourite burgers and we’d highly recommend it. 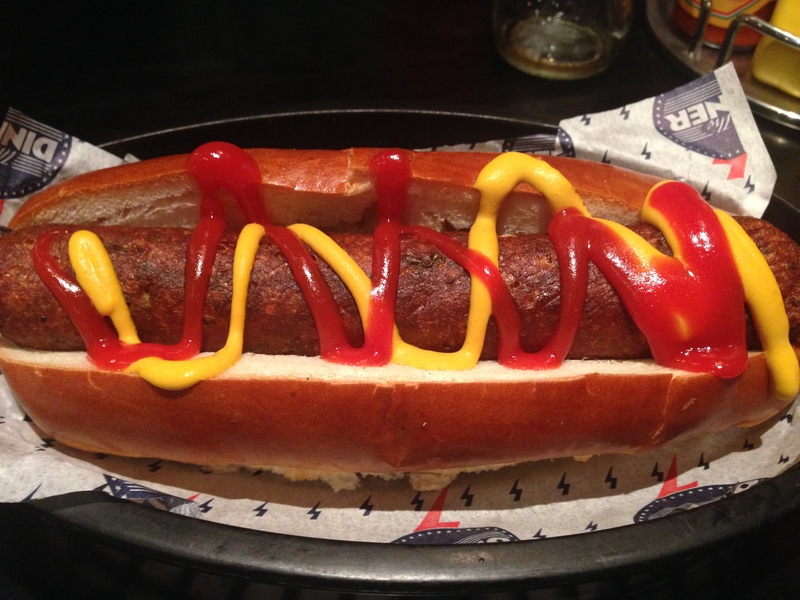 We thought we’d take a different path for our next item, the Big V Dog. This is the Diner’s vegetarian hot dog option and it comes smothered in ketchup and mustard and in a crisp and buttery hot dog roll. It’s tasty but perhaps best enjoyed with some added toppings such as onions or cheese. To round our meal off we tucked into some Diner fries. 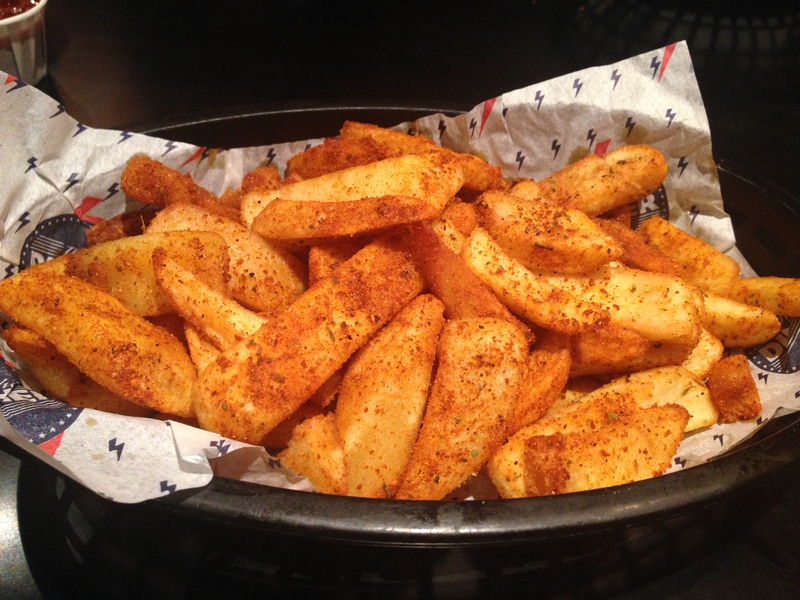 These are thick cut fries (…or chips for us Brits) with Cajun spice sprinkled across them. That added spice made them one of the best sides we’ve eaten in London so far, and the portion size was enough for three of us. With tough competition for burger joints in central London the Diner opt for an expansive menu and that variety certainly pays off. It’s a little daunting at first but once you settle down you’ll find enough to keep your whole party happy. The Price: Between £6 and £11 for your mains, £3.50 for your side, and a few pounds more for a soft drink. 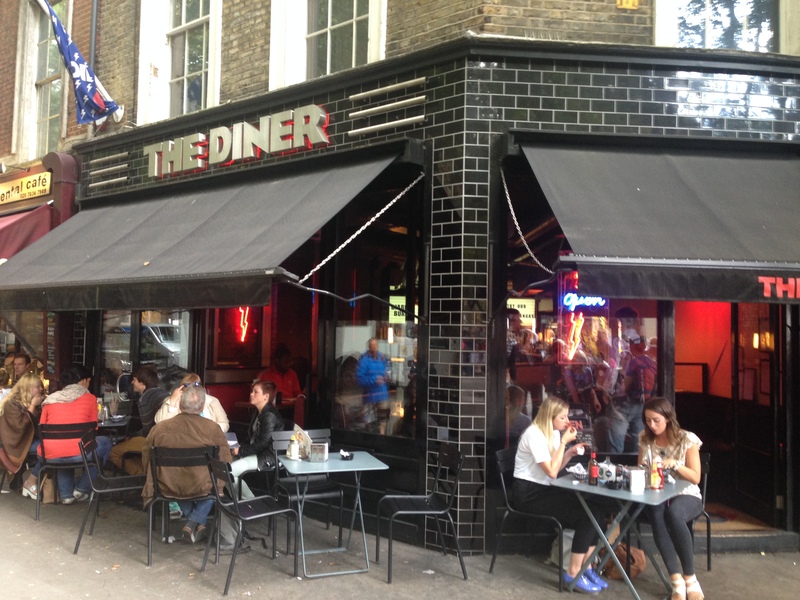 The Diner was visited by Nicola in August 2014. 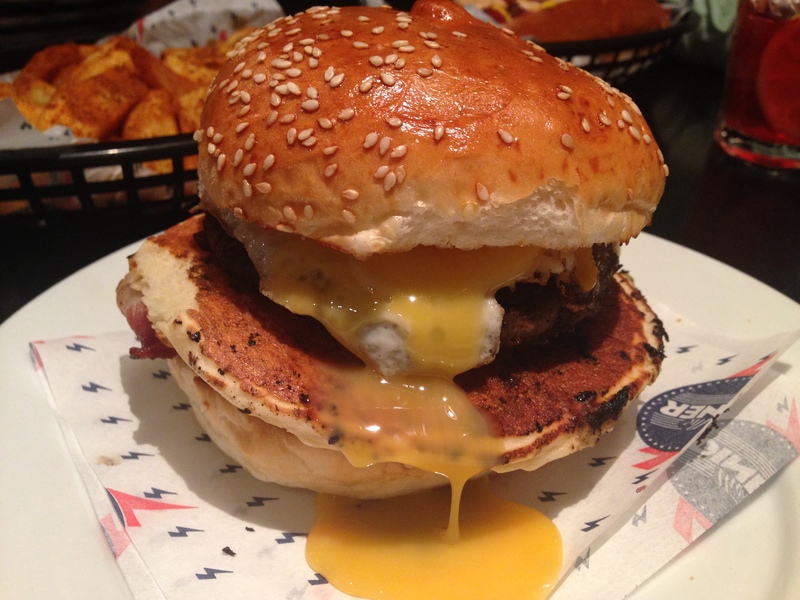 Posted in LondonTagged bacon, Brunch Burger, burger, cajun fries, cheese, covent garden, egg, Food, goodlife diner, hollandaise sauce, Hot dog, ketchup, London, lunch, mustard, pancake, Shaftesbury Avenue, the diner, vegetarianBookmark the permalink.